This is it! Our eight month tour of Oregon is drawing to a close. We started out by losing a day to the airlines, I’d seriously over-planned the vacation and we argued way too much along the way, but still, Oregon is one of the most amazing places I’ve ever been. Returning to Portland at the end of the vacation was almost like coming home and she continued to be a wonderful hostess. The drive from Astoria took longer than I realized it would and he was bushed, so while he took his afternoon nap, I worked on rearranging the luggage to the airline specifications. After his nap we decided to take in a movie and though I have no idea what movie we saw, I do remember the theater and you’ve got to go there. It’s called the Bagdad. Do you remember way back at the beginning of our trip when we headed out to the Columbia River Gorge via the McMenamins Edgefield Resort. Well, the Bagdad is part of the McMenamins brand. Another thing I’ll do if I go back to Oregon is visit more of the McMenamins empire. They’ve got funky down to a tee and have developed it into a collection of entertainment venues and sleeping accommodations that I’d like to know better. The Bagdad is one of those grand old theaters that way too many cities let disappear off the face of the earth. McMenamins saved this one and it sits in the Hawthorne District, one of Portland’s rejuvenated neighborhoods. You can have a pizza and beer while you watch the movie, but if the pizza’s not any better than the popcorn was, I’d stick to the beer. However, watching whatever movie we saw in that wondrous relic of a theater was a real treat. On the way back to our hotel, we lucked into another wonder: Laurelhurst Park. I caught a peek at it on the way to the theater and hoped the GPS would send us back to the Radisson that way. I hadn’t caught the name of it as we zipped past on the way to the Bagdad. It was the perfect place for a stroll. Portland people are outside-people, in spite of their rainy, misty sort of weather, they thrive in the out of doors. It was dusk and kind of chilly when we entered Laurelhurst Park, but Portlanders were out in force. They were walking their dogs and chatting with friends. I loved the atmosphere of the park. It was pretty with huge trees and a large pond full of water fowl. The next morning, we had a few hours to kill so we headed back downtown. Our goal was to have some lunch out of the food trucks. We’d found a whole section of downtown devoted to them, but hadn’t gotten around to eating a meal there. We felt very hip and cool as we sauntered among the Portlanders chatting up their favorite food truck entrepreneur. Bill had a gyro and I found some Southern fried chicken, just like Mom used to make. I have no idea how the delicious treat found it’s way there, but it was wonderful. Director Park is there in the background. But Portland had one more trick up her sleeve for us. The food truck area was not far away from the Portland Paramount Hotel, where we’d stayed earlier in the trip. We decided we’d take our food to Director Park, which is out in front of the Paramount, but surprise, surprise, a filming company had taken over the park and was making a TV show. It was great entertainment. They were filming an episode of Leverage, which I hadn’t watched previous to the vacation. Since then I’ve become a devoted fan and keep my eyes open for other Portland sites as I watch, since it’s now one of my favorite cities. Come back soon for a best and worst list of the trip. Then we’ll go someplace else together and you’re going to love it. Our final night in the City of Roses. Welcome to Oregon! Well, sort of. In June my husband and I spent twelve days traveling the state and now I’m sharing the experience with you. I’ll tell you about the attractions we visited, the meals we ate and where we stayed. Maybe you’ll decide you want to visit Oregon, too. Today’s focus is the best meal we had in Oregon. We finished our visit to the International Rose Test Garden with about an hour of sunlight left and a whole lot of Portland still to see. Leaving the rose garden we meandered through Washington Park and then sort of followed our noses around several areas of the city, trying to get a feel for something beyond downtown and the major tourist attractions. What we saw further underlined my notion that Portland was a city you could visit again and again without having to repeat yourself. However, we soon found ourselves without a clue to where we were or how to get back to any of those cute neighborhood restaurants we’d admired as we drove around aimlessly. We were really hungry, so I recommended we go to the Pearl District which is sort of the happening area of town. Aware that downtown closed by eight, we needed sustenance. We also wanted one more memory from a town we’d grown to love. After a few stabs at it, we found the Pearl District. It wasn’t First Thursday. In fact, it was late Saturday night, which in Dallas means things would have been hopping, but in Portland it was quiet. We parked the car (you don’t have to feed the meters on Saturday night) and started strolling. Passing one closed establishment after another, we wondered if it was going to have to be Taco Bell, again. Finally, we found something open – Trader Vic’s. That didn’t seem to be it, even if it was the only thing open. Bill said, “Let’s go a couple more blocks and if nothing is open, then we know we can come back here.” I reluctantly followed him down the sidewalk, because Trader Vic’s sounded pretty good to me. After a block or two, a couple of well-dressed women giggled and chattered their way into a black rod iron door. The sign read, “andina novoperuvian.” Bill had been to Guatemala on a mission trip, but Peru was a blank page with us, novo or not. Comparing notes, we wondered how different it could be from our beloved Tex-Mex and decided to give it a try. We opened the door on insanity. Everyone who was still awake in Portland must have been there. Peruvian pandemonium personified. I think there were two different wedding-related parties. There were lots of noise, gifts and music. Besides a couple of girls in the bathroom were having a conference to figure out whether they should let someone know that something happened to someone else, because it could put off the wedding and the question was whether that was the right thing to do or not. I’m sure they woke up in the morning, discovered they had it all wrong and were glad they hadn’t brought the wedding train to a halt. We’d entered on one floor, gone up to another to find the hostess and then were led somewhere else. I don’t exactly know where we landed, but the hullaboo we encountered at the entrance was far removed. We settled in for a pleasant dining experience…we just didn’t realize yet just how pleasant it was going to be. We were offered both a tapas menu and a dinner menu. Though we were hungry, it was a little late to be eating a huge meal, so we opted for tapas. We’re not completely unacquainted with tapas, but they’re not our usual Saturday night meal, so we needed some time to peruse the menu. Bill got a cold Corona to accompany his menu selection activity and I chose the white wine sangria. If we had left the restaurant immediately after the drinks, you’d still find me raving about the place. It was the absolute best sangria I’d ever had in my life – period, end of story. It was so good, I soon had a second one and if I hadn’t been worried about public intoxication, I would have had another. After careful consideration, we chose three small plates to share: Ensalada Verde Peruana, Tortilla de Patata and Anticucho de Corazon (AKA green salad, potatoes and beef kabobs). I’m here to tell you that the food tasted just like it sounded in Peruvian – DELICIOUS. The service was a little slow, but not too slow – and remember they were having riots upstairs. It was one of those dinners where you didn’t mind that they were a little tardy returning with the check, because even though you’ve eaten all your food, the meal is not yet over. I knew I had to stuff everything back into our suitcases and get ready for the road trip portion of our vacation, so we had to go back to the hotel. Even if you don’t go to anything else I’ve told you about in Portland, you absolutely must go to Andina. It’s totally first class and serves the best food we had in all of Oregon. So get ready to head out on the road, next week we’re on our way to the Columbia Gorge. Welcome to Oregon! Well, sort of. In June my husband and I spent twelve days traveling the state and now I’m sharing the experience with you. I’ll tell you about the attractions we visited, the meals we ate and where we stayed. Maybe you’ll decide you want to visit Oregon, too. Today’s focus is isn’t really a focus at all, just a summary of our Portland experience. Portland was a bittersweet experience for me. I loved everything I saw, but losing a day to the airlines really messed us up. I also loved arriving for Rose Week, the highlight of Portland’s year, but participating in all the festivities that I hadn’t realized would be going on meant taking attractions off my wish list. We stayed in the Portland Paramount Hotel and I recommend it strongly. It’s literally in the middle of everything. Out the front door is Director’s Park. A block away is a major transit stop. 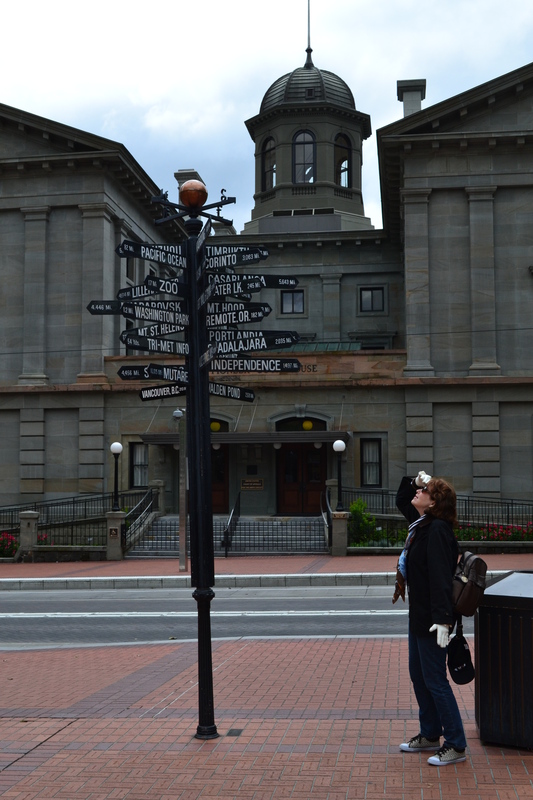 Pioneer Courthouse Square, Nordstrom’s, South Park Blocks, the art museum, even cheap parking are all just steps away. The lobby is chic without being ostentatious and the rooms are luxurious, if perhaps a bit of a squeeze. Their exercise room has plenty of aerobic equipment and some weights, too. The lobby bar seems to have a steady clientele, but we were always too busy to linger. The restaurant is Asian and that’s not our favorite food. They’re supposed to have American breakfast, but we didn’t try it. We fell in love with Flying Elephants Deli which was just across Director’s Park. Then when you got to wherever you had to park. Parking at our hotel was $29, so the first order of business after finding it was finding someplace else to park. We actually found a fairly decent solution (Smart Park) just a block away, but not until we’d driven around for at least a half hour exhausted, starving and disoriented. But that’s overnight parking. Lots of the venues we visited had their own parking lots, but for short term we fell in love with their parking meter system. One event I’d really been looking forward to was Portland’s First Thursday. The Pearl District is home to Portland’s Art Scene and on the First Thursday of every month they throw out the red carpet, staying open late and serving up snacks. I thought that with a 10:30 AM arrival, getting to First Thursday in the evening would be a no brainer. Our hotel was close to the street car line and I imagined an authentic experience, riding the street car to mingle with Portlander artsy types in their artsy district. That didn’t happen – thank you airline industry. I also missed OMSI and OHS – Oregon Museum of Science and Industry and the Oregon Historical Society. Portland’s Farmer’s Market at the end of the South Park Blocks was on my wish list, but it was that or the Grand Floral Parade, not much competition there. Didn’t make it to Powell’s Book Store either. Drove by it, but that’s all. So you see, I had just enough of Portland to want a whole lot more. Do you get the impression that we really liked Flying Elephants? Food was a whole ‘nother problem. The first night we begged a closing Jimmy Johns to make us a sandwich. For breakfast we ate at McDonald’s until we found the Flying Elephant. We found a Safeway and stored up on snacks and such. Taco Bell was another hit. I know Portland must have some amazing restaurants, but between trying to squeeze three days into two, taking in Rose Week and being lost most of the time, we didn’t find many good ones. The exception was Andina’s, but we’ll talk about it next week. Welcome to Oregon! Well, sort of. In June my husband and I spent twelve days traveling the state and now I’m sharing the experience with you. I’ll tell you about the attractions we visited, the meals we ate and where we stayed. Maybe you’ll decide you want to visit Oregon, too. Today’s focus is the International Rose Test Gardens. Where have all the trail blazers gone? You can’t visit Oregon without being overwhelmed with the idea of discovering something new. So where do the pioneers go now? Space? Under the ocean? To Silicon Valley? Perhaps one of the reasons the last century has seen so much innovation is because we ran out of places to go. The pioneers had to invent their own new thing, because it wasn’t just over the next river or mountain. But wherever we went, as soon as we got there we wanted everyone else to come. That’s how Portland became the Rose City. Portlanders were looking for their identity to encourage others to visit and someone or several someones had the idea of capitalizing on their climate’s suitability for growing roses. Roses weren’t native to the area. They had to ship them in. Maybe it was just because I was there during Rose Week, but I’m beginning to believe roses actually put Portland on the map. You may not think of roses when you think of Portland, but promoting roses unified the community and gave them something to care about together. Portland’s Rose Garden or more correctly International Rose Test Garden has a split personality. On one hand they are all about developing and testing roses for use all over the world, but on the other hand, it’s a tribute to the Royal Rosarians. Remember Pittock Mansion? Proudly displayed on one of the beds was a man’s white suit sporting a green Royal Rosarian banner. Remember the Grand Floral Parade? Folks are still wearing those white suits and green banners. Whole floats were devoted to them. Several carloads of them rolled by, waving to the crowds. The closest I can come to finding another group that parallels them are the krewes of Mardi Gras. Anyway, if you enter the garden according to the directions you get Portlandonline’s website just about the first thing you see is a garden dedicated to all the Royal Rosarian Prime Ministers. Think King Rex at Mardi Gras. Later on in the garden will be tributes to the rose queens and their courts, but the Prime Minister is the head guy in charge of it all. 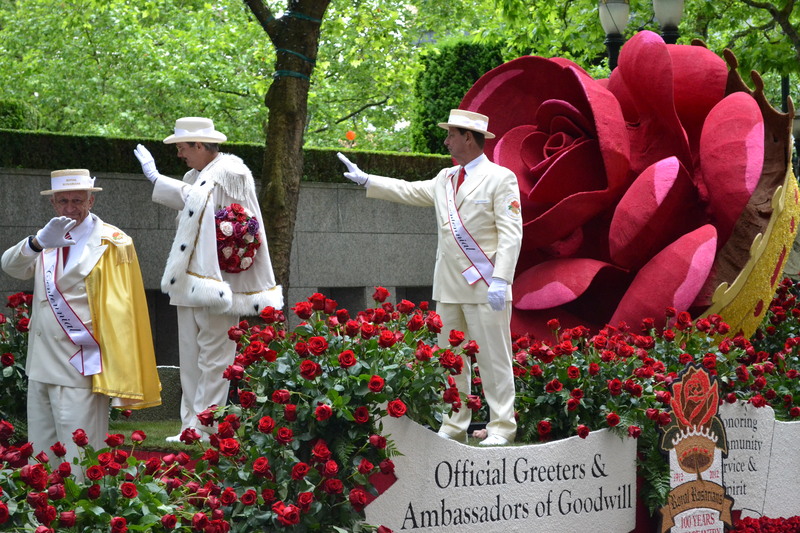 These guys may be millionaires or heads of industry, but you can tell from the garden that in Portland, if you want to be someone, you need to be Prime Minister of the Royal Rosarians. The gardens are gorgeous. They are also free. They’re even handicap accessible, so you have no reason not to visit when you go to the city. The gardens are also part of Washington Park, a huge public facility on the edge of town. Had I had the time I would have explored more of it. Along with the Japanese Garden and the International Rose Test Garden there is Hoyt Arboretum, the Vietnam Veterans Living Memorial, the Oregon Zoo, the World Forestry Center and Portland Children’s Museum. You can get to it via public transit. Next time I visit Portland (you’ll notice I said next time I visit, not if I visit again) I’ll be devoting more of my time to Washington Park. Monday we’ll take in more of Portland. Jaw dropping beauty in a blood pressure dropping atmosphere. Welcome to Oregon! Well, sort of. In June my husband and I spent twelve days traveling the state and now I’m sharing the experience with you. I’ll tell you about the attractions we visited, the meals we ate and where we stayed. Maybe you’ll decide you want to visit Oregon, too. Today’s focus is the Japanese Gardens in Portland. My husband thinks I’m crazy. After a day of sightseeing, a parade, city festivals and a crafts market, I still had things I wanted to do. We were headed to the Columbia River Gorge the next morning and even though I told myself that it wouldn’t be the end of the world if I didn’t get to see all the gardens in a city of gardens, I really didn’t want to miss anything. Looking at these pictures, I think you’ll agree with me that the Japanese Gardens are a must-see attraction, but be aware, they are not handicap-friendly. They do try to facilitate mobility-challenged people, but I think it would be difficult to manage without a lot of determination and for some people, impossible. The parking lot for the gardens gives no hint to what is ahead. We arrived late in the evening with less than an hour to see it all. From the parking lot, you enter a lovely forested glade which soon gives way to a steep path leading to the garden itself. Tall trees dapple the heavy undergrowth with sunlight. Though the primary road through the park is mere feet away, the visitor is immediately surrounded in quiet. The steep grade causes you to focus on putting one foot before the other, cleansing your mind of the worries of the day. Though I seem to have misplaced mine, at the entry gate you’ll be given a map that explains what you’ll see. 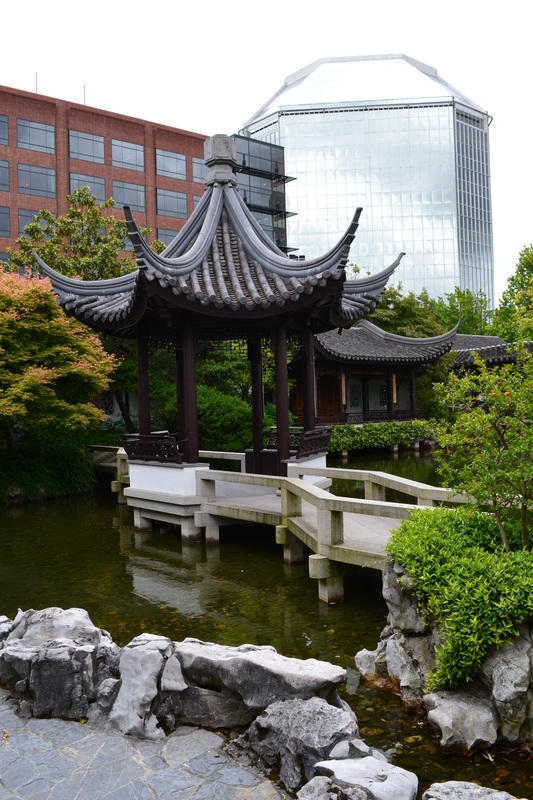 Like the Chinese Garden, admission to the Japanese Garden is $9.50. If I had to choose between them, I’d definitely make sure to see this one, but I still love Crystal Springs Rhododendron Garden the best. I’d also give myself more than an hour, but you take what you can get. There’s really nothing that I can say better than the garden can say for itself, so I’m going to quit the commentary and go right to our photographs. Come back next Monday and I’ll take you to the Rose Gardens. Welcome to Oregon! Well, sort of. In June my husband and I spent twelve days traveling the state and now I’m sharing the experience with you. I’ll tell you about the attractions we visited, the meals we ate and where we stayed. Maybe you’ll decide you want to visit Oregon, too. Today’s focus is Portland‘s Waterfront on the Willamette River. As we sat on the curb of Taylor Street watching the last of the Grand Floral Parade pass us by, we put the camera back in it’s bag and headed towards the waterfront with several thousand of our new friends in Portland. First, I’ve got to say that the Governor Tom McCall Waterfront Park is splendid. A large swathe of grass divides the waterfront from the city, then Taylor Street meets the esplanade in a series of wide steps down to the river. We definitely felt we’d arrived someplace special. One of the many seagoing vessels visiting Portland for Fleet Week. The grassy swathe was completely filled with the City Fair and a big fence ensured that admission fees would be collected. City Fair is a blocks long party, complete with rides, food and exhibits. We attend the State Fair of Texas here in Dallas every year and we’d already lost a day to the airline gods, so we just enjoyed the Portlanders enjoying the fair as we strolled along the esplanade. On the waterside of the esplanade were watercraft of every kind. Our first nautical sightings belonged to the Oregon Maritime Museum. The Museum is actually in a tugboat moored to a pier on the esplanade, but for Fleet Week, the museum area is filled with a variety of seagoing vessels, from river craft used in Viet Nam, to pleasure boats. Here are a couple of examples, but they were small beans compared to the big boys. We’d been enjoying glimpses of the big ships for a couple of days and now Bill was dragging me towards them. The Navy drops by the Portland Waterfront for Fleet Week. stuffed down a falafel sandwich. The Navy was calling. If you ever doubt the might of the American Navy, you’ve never been to Fleet Week. Standing on the esplanade walkway gazing at the Navy ships we gained a new respect for our seagoing military. Shipshape and watertight, the gray ships define preparedness. Bill and I spent the next hour walking alongside the ships and then up over a bridge to look towards them. Awe inspiring? That’s as close as I can get to the right word. I know nothing about ships, but it seems I heard someone say Destroyer Class. I know they weren’t aircraft carriers, because they didn’t have a flat top, but there were some ominous looking gun barrels wrapped in custom designed covers. I wouldn’t want those things pointing my way uncovered. People were lined up to the moon, waiting to get onto the ships where the white-clad sailors were giving tours, but we saw all we wanted to see from the shore. Eventually, we headed back to the Saturday Market, but we were already on sensory overload and it was Bill’s nap time. We were on vacation after all. The booths spread out from the esplanade all the way to the train tracks next to the Skidmore Fountain. I would have thought with the City Fair and Fleet Week, the Saturday Markets would have been neglected, however it was wild. There was too much to take in. I know there were food stalls, because we’d eaten a sandwich from one. I remember jewelry and clothing, but the rest of the booths merged into a wild cacophony of visual noise. For audio distraction, there were several groups playing instruments, providing samples of the CD’s they had for sale. I looped a finger through Bill’s belt afraid one of us would get lost in the crowd. One thing to love about Portland is their mass transit system. Downtown is a free zone. Reaching the Skidmore Fountain, we contemplated walking back to our hotel, but felt as if we had to try out the metro. I didn’t have a map or anything, just a general idea of where we were headed. We jumped on a train going in what we thought was the right direction and got off a block from our hotel. Marvelous! I’ve already confessed that I lucked into Rose Week. I felt guilty when everyone else seemed to have come specifically for it. If you can work it out to be in Portland in early June I highly recommend attending the events on purpose. Portland is a great city with a lot to see, but it becomes one great big festival when the roses bloom and fleet comes to town. Next week we’ll turn the volume down (way down) and visit Portland’s Japanese Garden. Welcome to Oregon! Well, sort of. In June my husband and I spent twelve days traveling the state and now I’m sharing the experience with you. I’ll tell you about the attractions we visited, the meals we ate and where we stayed. Maybe you’ll decide you want to visit Oregon, too. 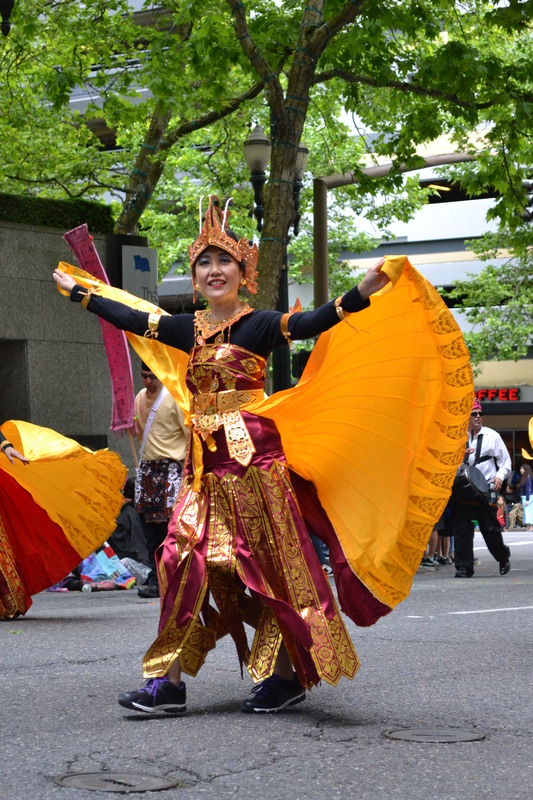 Today’s focus is Portland‘s Grand Floral Parade. When you travel there’s what you plan and there’s what just happens. In the just what happens category, there can be bad things like the weather that delayed my flight and made me lose a day of sightseeing – and there’s the good stuff. I’ve mentioned this vacation was originally planned for May, but several things moved it to June. During my original research, I heard about Portland’s Rose Festival, but since I wasn’t planning to be there in June, I just ignored it and promptly forgot all about it. So what is the Grand Floral Parade? Think Pasadena’s Rose Bowl Parade on New Year’s Day, but imagine that moments before the parade arrived at a spot just a block or two from your hotel, you strolled over and got a great curbside vantage point. Like the Rose Bowl Parade, the gorgeous floats in the Grand Floral Parade must be completely covered in organic materials. Unlike the Rose Bowl Parade, you don’t need a reservation months in advance. I sort of assumed Pasadena was the mother of all parades and figured that if anybody else had a parade with flower covered floats, it must be a copy cat, but au contrare! Remember Pittock Mansion. Well even before the mansion, the Pittocks were pretty important people, given that he ran the paper. Mrs. Pittock liked roses and decided to have a party where she and her friends could show off their blooms. The husbands didn’t like the idea of being left out of the fun, so they formed a group they called the Royal Rosarians. 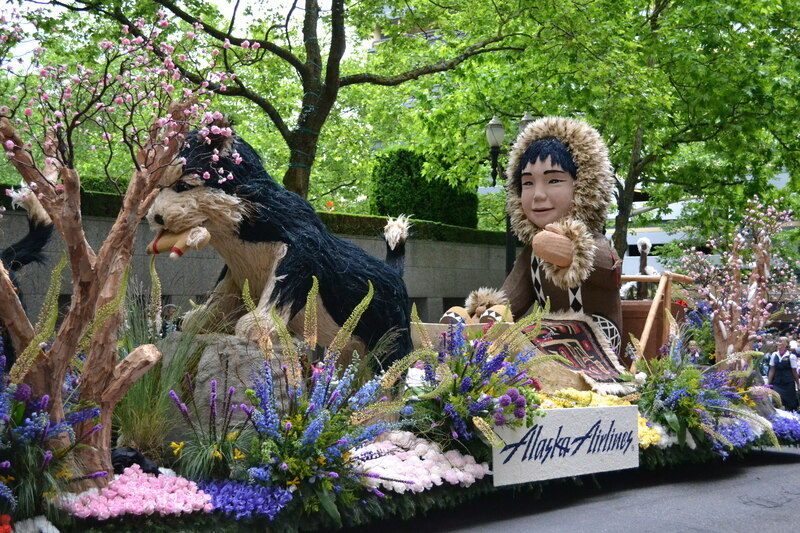 The seeds of the 100th annual Grand Floral Parade were planted. Pasadena’s parade has only been around since 1929. 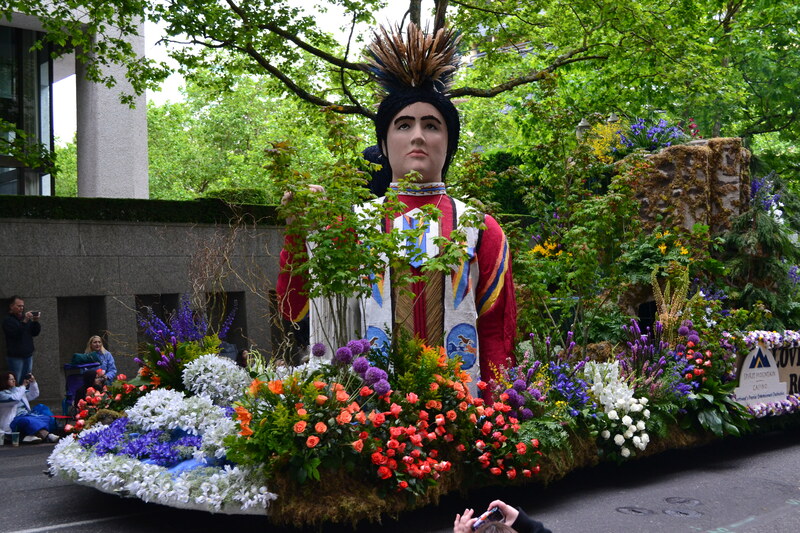 Imagine what the Grand Floral Parade would be if they’d hooked it up to a football bowl game! So, after throwing away my itinerary and deciding to have a good time, I joined Bill for breakfast at Flying Elephant’s Deli next to Director’s Park. It’s not your everyday deli, so you should certainly plan to have a meal there. 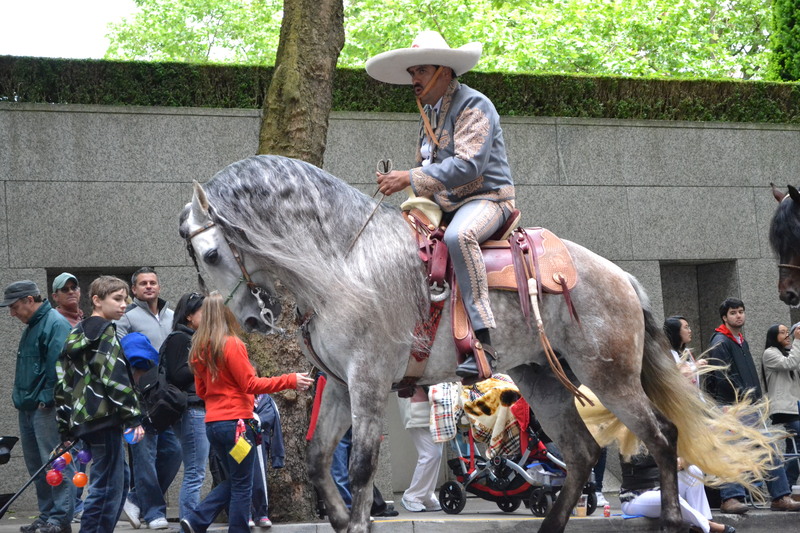 Then we strolled over to Pioneer Courthouse Square, because it was getting near parade time and it would be passing right by the plaza, which was on my list of must-see sights. 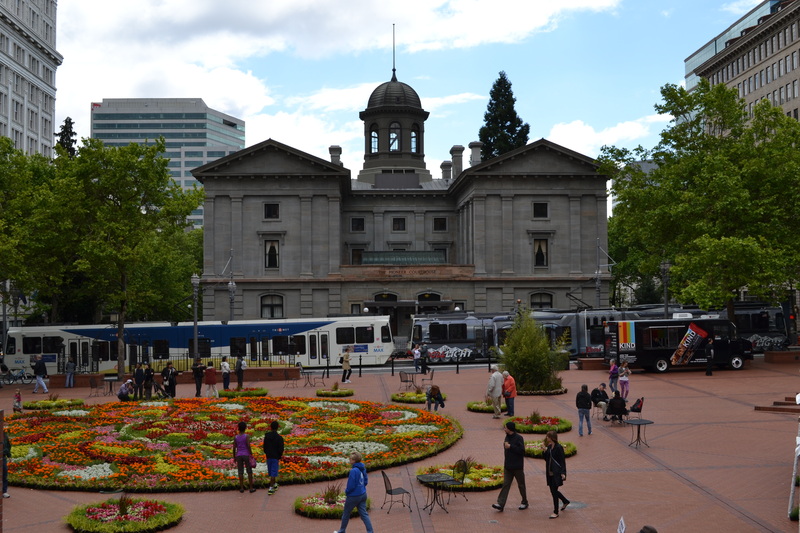 Since it was the week of the Rose Festival, the center of the square was filled with potted plants. Here’a few shots of the photos we took while we waited. I’m sure there are people somewhere that can tell you how long a parade will take to get from here to there, but no one we talked to did a very good job of guesstimating when the parade would get to us, so after we’d taken our quota of Pioneer Courthouse Square shots, we started to make our way backwards along the parade route. Don’t think that because the crowds are smaller for the Portland parade that there are no crowds, because that would be wrong. Portland is just not the same thing as Pasadena. There are no tickets to buy and people can’t even begin to “save” spots until the morning of the parade, so there it’s just not the manic, stressful event Pasadena has grown into. As the crowds waited for the parade to come, kids played in the streets while the adults stood about three folks deep along the route with plenty of elbow room. Vendors with pushcarts strolled down the street with souvenirs. It was a lot of fun. Eventually, several blocks from the Square, the mood changed. I couldn’t see anything, but we were approaching an intersection where the parade route made a turn. The people on the perpendicular street were standing, looking down the street away from us, almost leaning into the direction from which the parade would come. As if the gods had saved it for us, we found ourselves standing directly behind a family that was all set up to watch the parade from low chairs, giving us a perfect view of the festivities. We stood and waited for the parade to reach us. We were wowed by the floats, enchanted by the equestrians and invigorated by the bands. Horses weren’t the only livestock. Llamas and ponies also streamed past us, each dolled up to the max. Chinese dragons wove their way among costumed marchers. Giant Hispanic characters frightened small children. Modes of transportation from horsedrawn firewagons to the zoo’s miniature train joined in the parade. 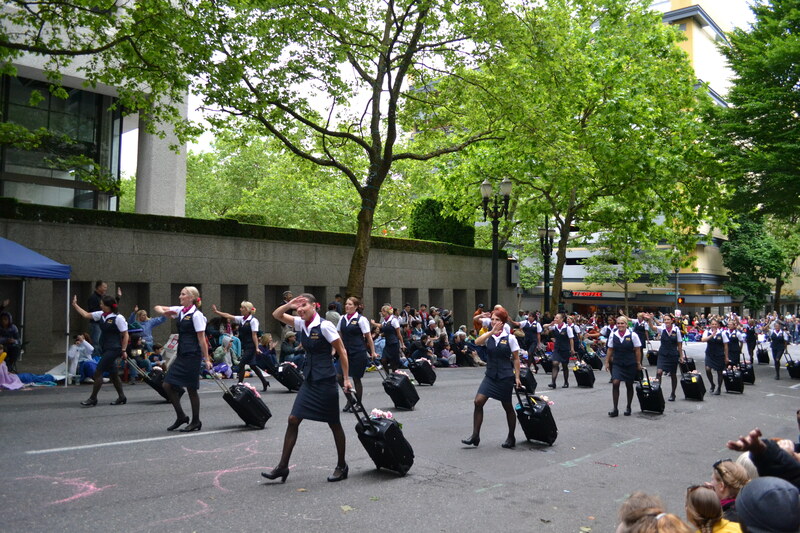 Every person along the parade route stood up in honor of the Marine Band, but I’d have to say my favorite marchers were probably this contingent of airline hostesses dragging along their rolling suitcases. This post could go on forever, because we have so many great pictures of gorgeous floats, breath-taking horses, funny costumes and automobiles full of pretty girls waving at the crowd, but like all parades, this one, too, must end. Join me next Monday to find out about Fleet Week and the City Fair, which both happen concurrently with Rose Week. We’ll also drop by the Portland Saturday Markets. Welcome to Oregon! Well, sort of. In June my husband and I spent twelve days traveling the state and now I’m sharing the experience with you. I’ll tell you about the attractions we visited, the meals we ate and where we stayed. Maybe you’ll decide you want to visit Oregon, too. Today’s focus is the Portland Art Museum. OK, I live in Dallas and I love my museum of art, but I’ll be the first to tell you it’s a little confusing. I felt a whole lot better about it after visiting PAM. Like the DMA, at PAM you’ll find there are times you just can’t get to what you are looking at from where you are without going someplace else. On top of that, the PAM is actually housed in two different buildings, but there is only one entrance. At the DMA you’ve only got one building, but three entrances, as well as a couple of courtyards you can get turned around in. In other words I felt right at home navigating under a courtyard to get to PAM’s building number two. Actually, visiting PAM was a pleasure. On a Friday evening we strolled a few blocks down SW Ninth Avenue from our hotel to the museum, enjoying the South Park Blocks along the way. 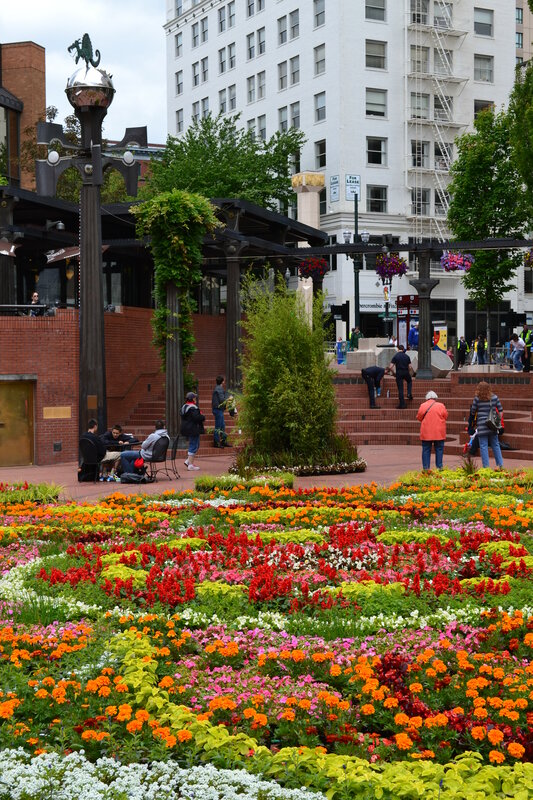 The South Park Blocks are exaggerated medians between SW Ninth Avenue and SW Park Avenue, providing green space and sculpture in the middle of the city. The museum is open until eight on Fridays and because we’re members at the Friend level at the DMA, admission didn’t cost a penny. The rest of you guys will have to pay $15 to get in. If art is one of your hot points, then make the time to visit the museum. If it’s not, I’ll let you slide on this one. It’s a nice museum with a lot to see, but they don’t exactly have the Mona Lisa or her sister. PAM has a little bit of this and a little bit of that. Downstairs near the entry was a lot of Oriental art – appropriate in a city where there is a lot of Oriental influences. On two, in the main building, you’ll find the usual European and American paintings. My favorite thing on that floor was the English silver – gorgeous. Then it starts getting weird – architecturally. The rest of the main building is primarily devoted to Native American art. Confession, I’m not well-versed on Native American art, so it doesn’t interest me as much as European paintings and English silver, which I thrive on. Between the odd architectural footprint and the art I don’t appreciate as much as I should, I pretty much skimmed this part of the museum with one exception. They had a series of paintings of Oregon landscapes by Oregon artists. That I loved. Having properly viewed building one, we headed to the basement to get to building two. In the gallery between the buildings Jeff Koons had tied a vacuum cleaner to a metal frame. I don’t get him either, but he probably wouldn’t care. Building two is all about modern and contemporary art. My favorite thing was the Impressionists. They really had some good ones, including a Van Gogh I didn’t even know existed. 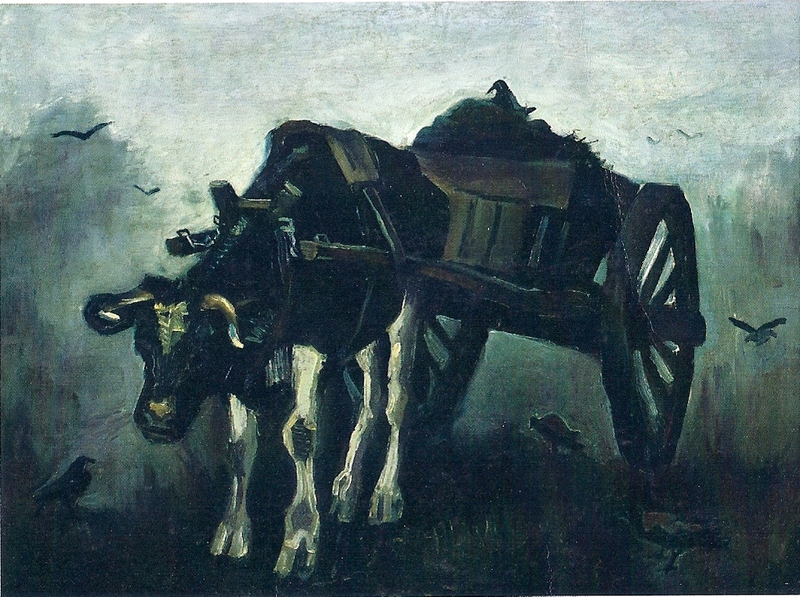 I’m not exactly an expert on Van Gogh, but I am a big fan, so I don’t usually find Van Goghs I haven’t even heard of. 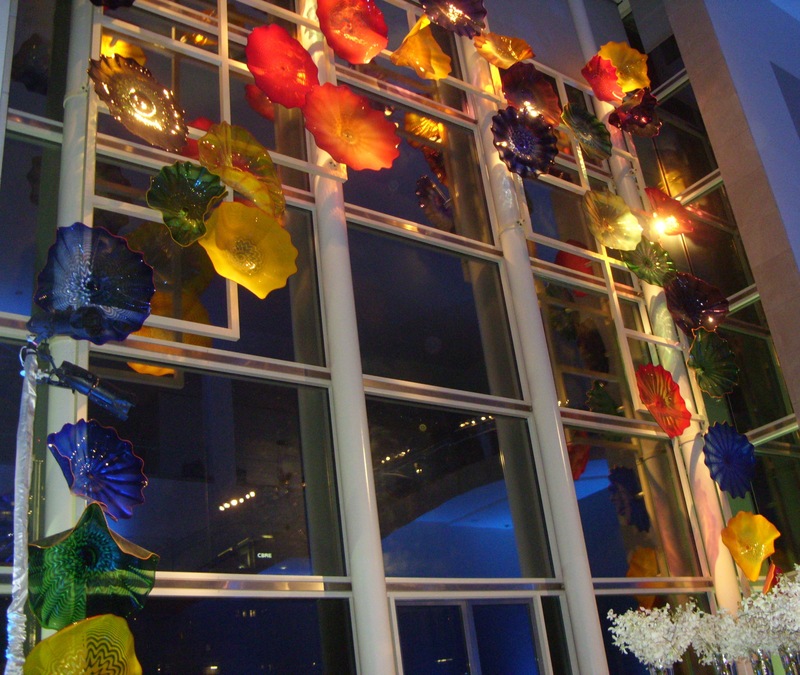 Here’s how the DMA’s Chihuly looked at a wedding I attended there recently! that I’d seen at different times at different places all over the world. The museum also has a nice Chihuly, but I really can’t remember whether it was in the Contemporary building or up at the top of building one, with the Northwest artists. If I were Chihuly, I’d be mad, because which ever building it was in, it wasn’t displayed as fantastically as the DMA’s Chihuly. We finished off the evening by having dinner at the Governor Hotel. Lots of history has happened there and they have lovely Arts and Crafts furnishings in their Lewis & Clark themed lobby and restaurant. Jake’s Grill looked good and we had a nice meal there, but the chef must have had a bunch of onions about to go bad in the kitchen, because there really wasn’t much soup in the French onion soup. So, go or no to the PAM when you visit Portland and I’d say the same about The Governor. Next Monday I’ll tell you about the Grand Floral Parade. Welcome to Oregon! Well, sort of. In June my husband and I spent twelve days traveling the state and now I’m sharing the experience with you. I’ll tell you about the attractions we visited, the meals we ate and where we stayed. Maybe you’ll decide you want to visit Oregon, too. 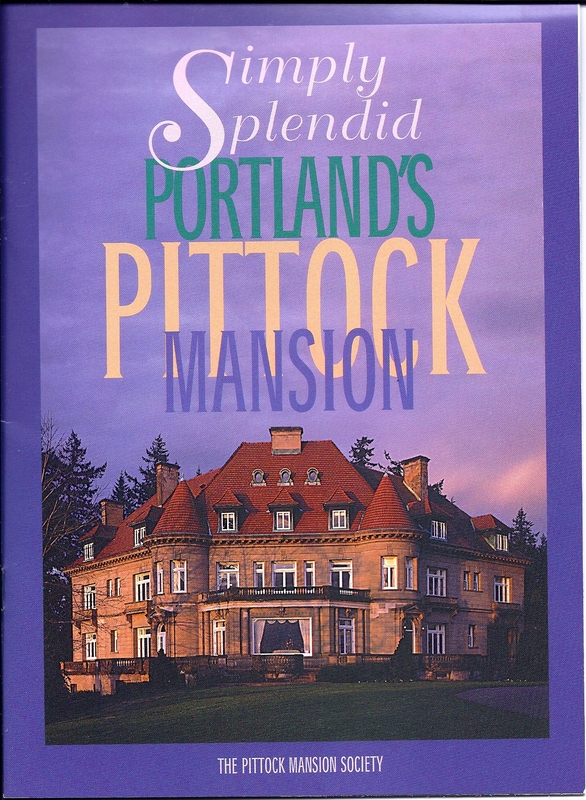 Today’s focus is is the Pittock Mansion in Portland. I think Oregon needs to invest in some good PR. Pittock Mansion is every bit as grand and glorious as the other grand and glorious mansions I’ve seen around the nation, but figuring this out without a lot of research is almost impossible. On Portland’s own tourism site, it takes several clicks to get to the top attractions and Pittock Mansion is seventh on the list below a book store and a coffee shop. There is something wrong with this picture. And speaking of pictures, the photograph on the Portland site wouldn’t excite me to visit the mansion and the other travel guides I read didn’t do much better. However, historic homes rate right up there with gardens for me, so I wasn’t satisfied with the information I was being fed. I kept digging. Still, even after I decided to make visiting the home a high priority, I really didn’t get impressed until I was inside the mansion. There is no grand entrance as you climb the hill approaching the home. After buying our tickets in what seemed to be a gatehouse, we were directed to a porte cochere where a nondescript side door provides access. After a modest entry hall, we wandered into the grand Stair Hall. Finally, I felt like I was in a mansion. We were lucky enough to hook up with a tour which was only a couple of rooms ahead of us. Maybe one of the reasons Portland doesn’t take this grand old lady of architecture as seriously as they should is because the owners didn’t take it very seriously, either. According to our guide, this lovely Stair Hall was used by the Pittock children as a skating rink. Another reason for the house’s less than spectacular reputation might be that the architect hadn’t quite figured out how to do homes when he designed the Pittock Mansion in the early 1900’s. The guide told us the architect had only designed office buildings prior to his commission for the Pittock home. The way the Stair Hall dominates the house on all three of the main floors demonstrates a similarity to commercial spaces. Also very commercial is the way the house was set up in suites, instead of having a floor or wing of the house devoted to sleeping spaces. Since Mr. Pittock was already seventy-five when he started planning the mansion, his girls were married and the children who skated in the Stair Hall were actually grandchildren. Mr. & Mr. Pittock had one suite and then each of their daughter’s had separate suites which held their immediate families. In spite of it’s odd configuration, this is a home you should see. Sadly, Mr. and Mrs. Pittock only lived in the house for a few years after it was finished. She died four years after the home’s completion and he passed away a year later. One of their grandsons, Peter, lived in the mansion until 1958, but by 1962 the house had fallen on hard times – or you might say suffered a hard fall. The Columbus Day Storm of 1962 had hurricane force winds which knocked down trees, which in turn fell on the home, threatening the integrity of its structure. Had it not been for devoted Portlanders, the home would have been razed. It took several years to gather the funds they needed, but restoration began in earnest in 1968. Even if architecture and history isn’t exactly your thing, you still might enjoy the mansion. Henry was an innovator and a forward thinker. His bathroom rivals anything HGTV designers dream up. The views of Portland from the lawn are spectacular. And it’s only $8. A ticket to the Biltmore Mansion can set you back $59. You’ll learn more about the Pittocks as I share more information with you about Portland, but I’ll stop here for today. Next week I’ll tell you about the Portland Museum of Art. Welcome to Oregon! Well, sort of. In June my husband and I spent twelve days traveling the state and now I’m sharing the experience with you. I’ll tell you about the attractions we visited, the meals we ate and where we stayed. Maybe you’ll decide you want to visit Oregon, too. 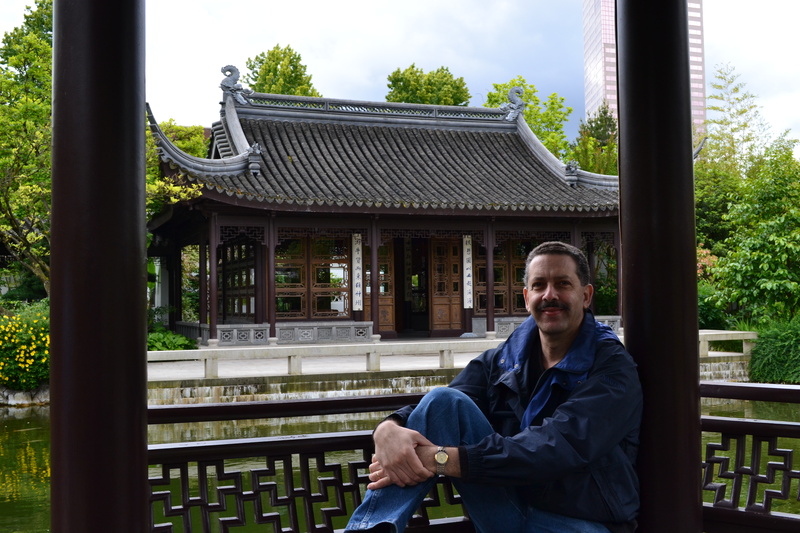 Today’s focus is is the Lan Su Chinese Garden in Portland. After being chased out of Crystal Springs Rhododendron Garden by a downpour we headed back towards town. I’d been told that the rain was pretty much a constant, but the downpours were short-lived. 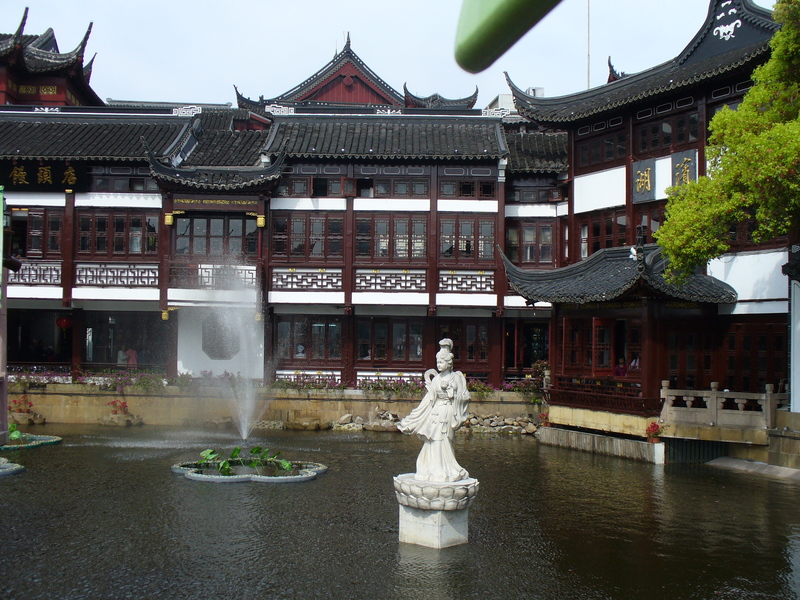 Since Lan Su Chinese Garden was next on my agenda I put the address into the GPS and headed that way. 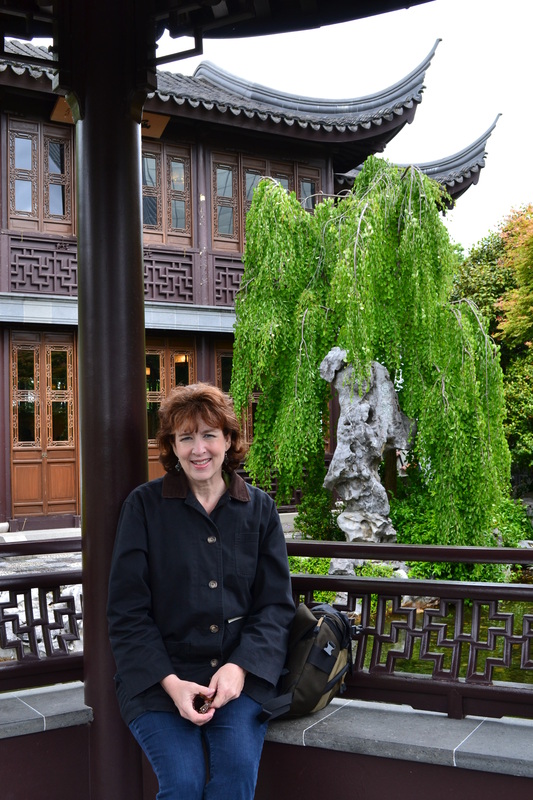 By the time we arrived in Chinatown the rain was over. 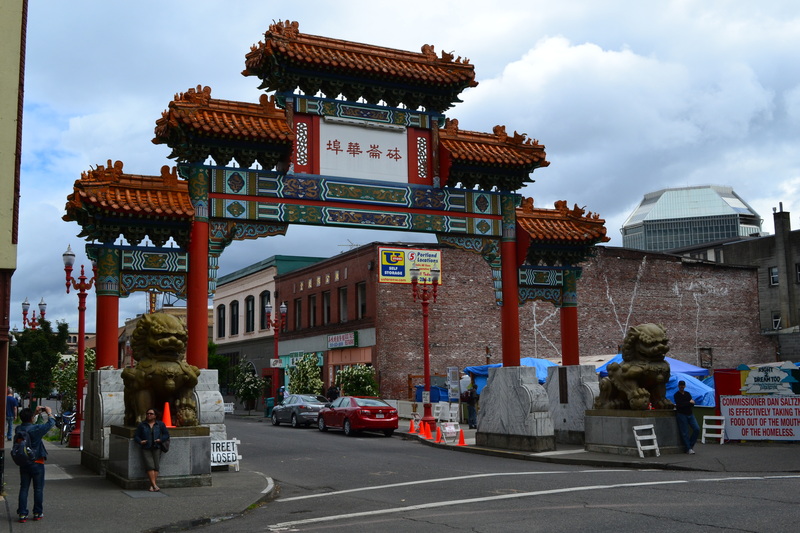 As I hopped out of the car just outside Chinatown to snap a picture of the Gateway, I was only partially aware of the tent city to the left of the gate, but as I lined up the picture it became quite obvious. Strolling back to the car I paid more attention and realized it was some sort of campground for homeless people. There’s a big sign which shows an artist’s rendering of how they hope to transform the empty lot – but even after it is transformed, it’s supposed to be a sanctuary for the homeless. For now, there is a makeshift fence around the area and a gatekeeper. His sign warns you that the area is restricted to “Dreamers,” but his look told me I didn’t qualify, dreams or no dreams. In my Oregonian Overview I mentioned that you had to differentiate between homeless people and office professionals by smell, because everyone dressed the same on the street. I have to tell you that one of the reasons I made this observation is because there are a lot of homeless people in Portland – at least downtown. Arriving late at night and walking around, trying to find food after we parked the car, we encountered what seemed to be a large number of vagrants – at least it was a much larger contingency of the population than I’m used to seeing in Dallas. Chinatown is a rough area, but not scary. The homeless people are everywhere, but they aren’t aggressive. No one even approached us for a handout. Still, I was glad I had come in the middle of the day. A lot of the buildings are empty and everything is run down. It’s sad, because there are hints that this was once a vibrant community, but it’s definitely in decline. The park is just a block or so from the gate. We found parking on the street without any trouble. I loved the Portland parking meters. Instead of having to jam coins in the meter and hope the maximum time will be enough, you can charge it on your credit card. In every block, there’s a centralized terminal allowing you to walk up, put in your credit card and tell the machine how much time you want. tells you that Lan Su is a must. I agree, but if I could only see one garden, I’d choose Crystal Springs, just to be a contrarian. Lan Su is not very big, so it won’t take up much of your time. Admission is $9.50, something else in Crystal Springs favor. 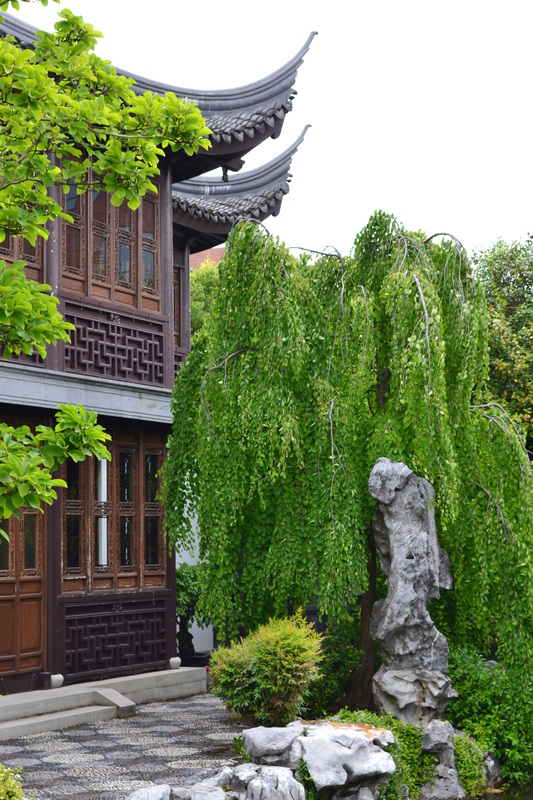 My husband has been to water gardens in China and he tells me that Lan Su is very authentic to his experience in Shanghai’s Yuyuan Garden, which corroborates the guidebooks claim that Lan Su is the most authentic Chinese Garden outside China. I hope you enjoy our pictures of the garden and want to go yourself someday. Next Monday we’ll leave the gardens for a while and I’ll tell you about Pittock Mansion.